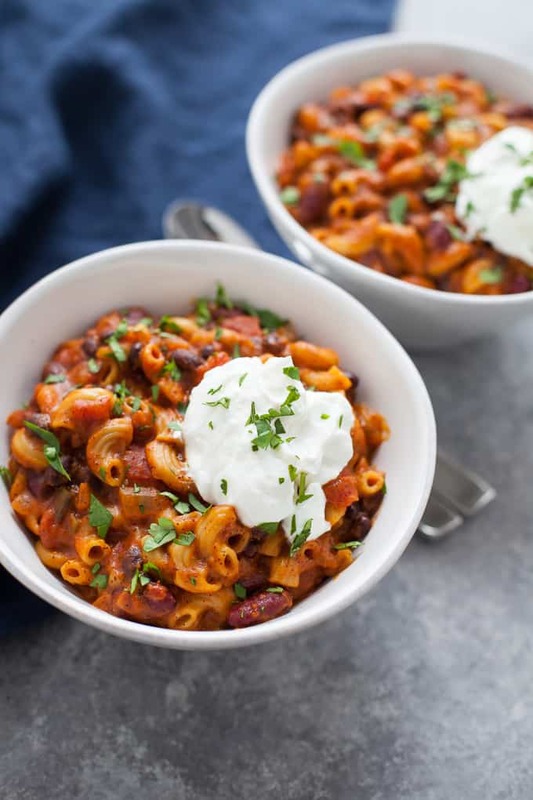 Ultra hearty and satisfying, this Easy Instant Pot Vegetarian Chili Mac is the perfect game day meal, just in time for the Super Bowl! Have I told you how much I love my Instant Pot (affiliate link) lately? As evidenced by my last recipe for Easy Vegetarian Chili. I took that chili recipe and modified it to make it heartier…and cheesier. Enter CHILI MAC! For the 60-second video on how to make this recipe, watch the video below! 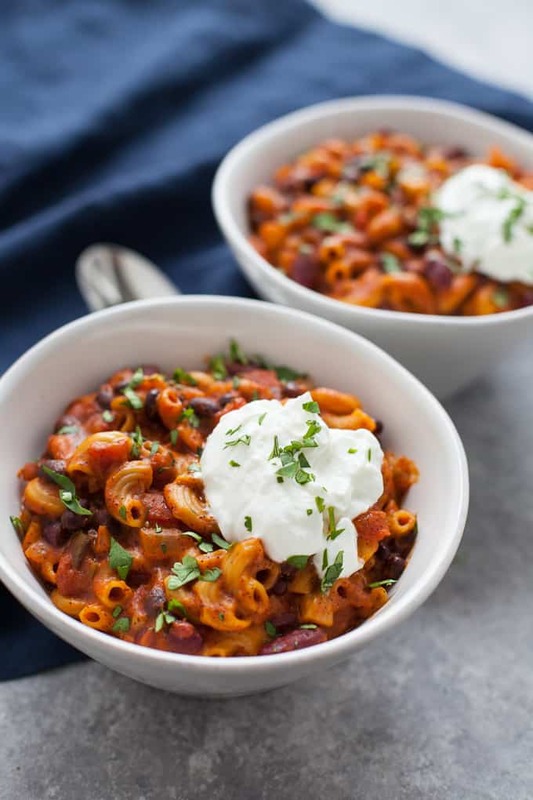 I haven’t had anything remotely close to chili mac since I was a kid and my grandmother used to make Hungarian goulash. I remember not caring for it that much but chili mac is 238309x better. We’ve eaten it twice in the last few weeks now (the joys of recipe testing) and have loved every bite. Before intuitive eating, I probably would have had some thoughts or beliefs about this dish. Like chili AND pasta, now that seems indulgent. But now I’m able to see this as a balanced meal. Pasta, beans, tomatoes, onions, peppers, and cheese. Ultimate macronutrient (carbs, protein and fat) package there! Not to mention the satisfaction factor! OH MAH GAWD. It’s so hearty and satisfying, which makes it perfect for a Super Bowl dish. And since it takes 5 minutes to cook in the Instant Pot, it will be super easy to make (and clean up!) for your Super Bowl party. I made this with both regular elbow pasta and whole-wheat elbows and I liked the whole-wheat better. 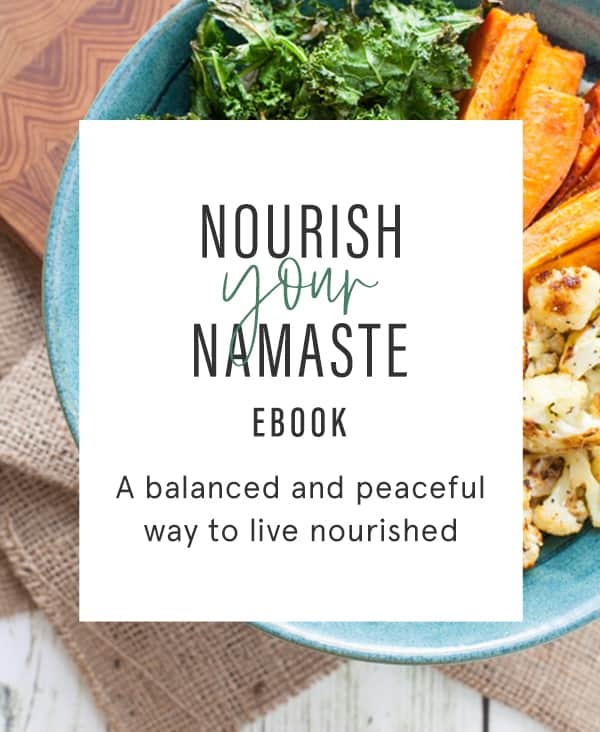 I thought it provided a little more nuttiness and satiety but you can use whichever speaks to you! If you’re vegan, omit the cheese or add non-dairy meltable cheese. If you’re not vegetarian, you can easily add some ground beef and leave out the black beans. I love how the cheese adds a level of creaminess to this dish. 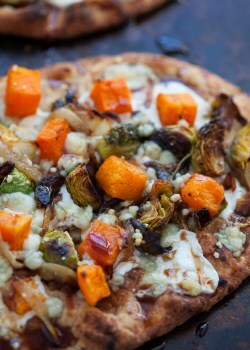 Top it off with some cilantro and a dollop of Greek yogurt (or sour cream) and you’re good to go! We’re heading over to our friend’s house on Sunday to watch the game and I have a feeling this dish will be making an appearance :). What are your plans for the big game? Anyone else in it just for the food and commercials, or is that just me? Add olive oil to Instant Pot and set to saute function for 5 minutes. Add onion, bell pepper, jalapeno pepper, chili powder, cumin, chipotle powder and salt and stir to combine. Add in garlic and set to saute for 1 minute. Add diced tomatoes, tomato sauce, black beans, kidney beans, elbow pasta and vegetable broth and stir to combine. Secure lid onto Instant Pot and set to pressure cook/manual for 5 minutes. Once pressure is released, open lid and stir in cheeses until melted and combined. Optional: serve with chopped cilantro and dollop of Greek yogurt. This recipe has some kick to it! Be sure to remove the ribs and seeds of the jalapeno pepper to make it less spicy. Or, you can always leave it out if you’re not feeling the heat! What are you making in your Instant Pot lately? 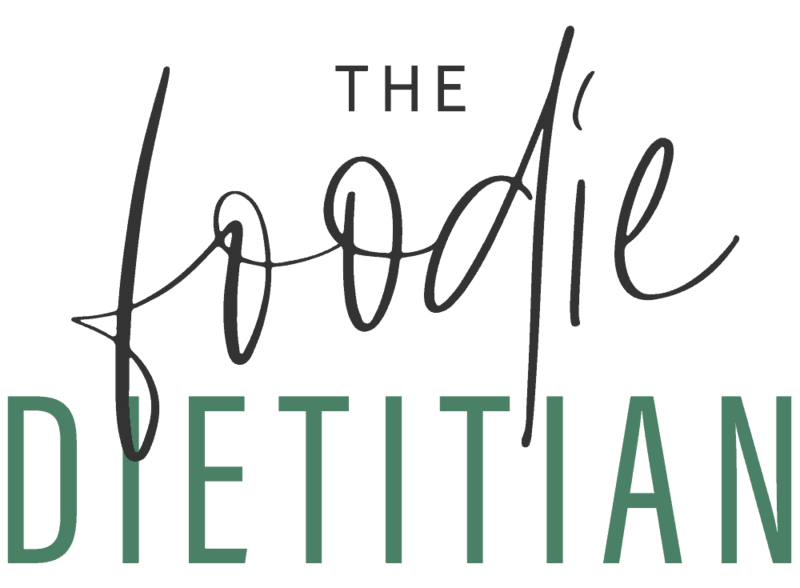 For more comfort food inspiration, check out my recipes below! This was fantastic!! Definitely a keeper!! This was delicious! Added a little jalapeño salsa and a dollop of guacamole once served. Will definitely make again. Thanks for the great recipe! This was amazing, super easy, fast and delicious! Made the recipe exactly as is and loved it. I was just wondering if you’ve tried to make it with more veggies like adding in zucchini or cauliflower or even an extra bell pepper? I was going to try that next time, but I am wondering if you recommend adjusting the cook time or liquids in any way? Have made this twice successfully, but have had to work around the dreaded BURN error both times with my 8 Quart Instant Pot Duo. Follow your recipe to a T, but when the pot is attempting to pressurize, I get the burn error, so I just shut it down, open/stir and then attempt to come to pressure again and when the second burn error hits it’s done perfectly. Maybe next time I’ll try low pressure instead of high. I even added a cup of lager beer to the recipe to try and get around the BURN, but still no luck. Oh, I also doubled the cheese and it comes out real good. Great recipe though. Great recipe! Turned out perfectly, although I may cut the heat a bit the next time I make it. Thank you for sharing! Doubled the recipe for my 8 quart thinking it would be fine, but realized I had to leave the beans out until after cooking because I was just a tiny bit over the max fill for expanding foods and didn’t want to risk the thing exploding. Added the beans before the cheese and it turned out fine. Thanks for the recipe! Glad it turned out fine. Thanks for sharing, Harry! Thank you for the recipe! I have a 3 quart instant pot. Is that big enough for this recipe? If not how much should I scale the quantities down? I have a mini (3 qt), and I just cut all the quantities in half. Seemed to work pretty well. It looks like cutting it in half should do the trick! Wow! We just finished eating this and it was delicious! Everyone loved it, including the non-vegetarians! Woohoo! So glad everyone enjoyed it, Christy! I’ve made this twice in two weeks. It’s pretty great and super easy. Awesome! So glad you’re enjoying it, Susan! 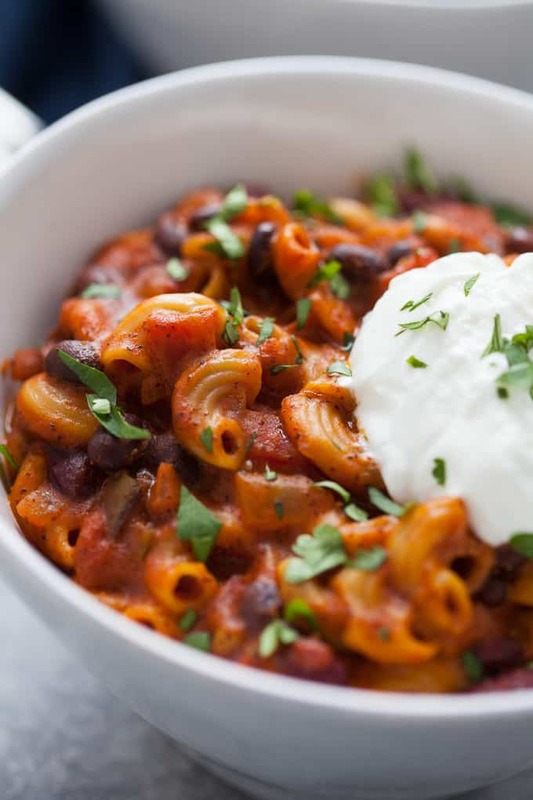 I made Instant Pot Vegetarian Chili Mac for my husband and myself for supper. My husband said it was some of the best chili he ever had. We had it again and I still had some leftovers. I took it to my daughter’s, who sent it to work for my granddaughter’s lunch. She is a vegetarian. She loved it so much that she requested it again the next day. Definitely a major hit in my family! I’m not sure if my daughter got any or not. Thanks for a great recipe which is healthy and easy. Would love to know nutritional break down calorie count per serving, really. Any clue? Unfortunately I don’t have an instant pot, so I was wondering what would the cooking time for this recipe would look like if you were to use a crockpot. Cook all the ingredients except pasta and cheeses for 7-8 hours on low or 3-4 hours on high. Add pasta and cheese and cook on low for additional 15 minutes. Let me know how it turns out. Enjoy! So very good!! I just made this. 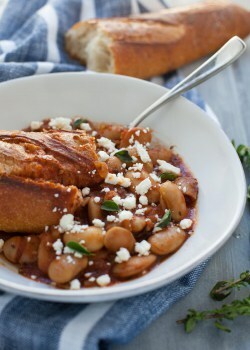 Use pinto beans instead kidney beans and also use normal chilli peppers cos don’t have jalapeños peppers. I follow almost same except add all tomato at end on top and no stirring to prevent burn error. Works fine! Defo will make this again. Awesome! Glad you enjoyed it, Jay! Oh no! What a bummer. I’m honestly not sure what could’ve happened as I’ve made this a few times now with no issues. You used all the liquid called for? It sounds like maybe there wasn’t enough liquid? Glad at least the part you were able to salvage was tasty! The recipe mentions 6 servings and I’m making it for 1 person with the intent of leftovers. How large is 1 serving? At what point could I add ground meat to the recipe? At the same time as sauteing the veggies or before/after? this looks delicious! 2 questions – would this work just as well with gluten free pasta, and do you think if i doubled it, it would still fit in a 6qt instant pot? thanks! I’ve never tried cooking gluten-free pasta in an Instant Pot but I would think it would cook just as well. And I don’t think it would fit if you doubled it – there’s usually a fill line on the pot – I would just be careful not to fill over it. If you try it, please report back! Hi Kara – VERY belatedly following up. Gluten free pasta works great! A bit mushier, but I mean, it’s mac n cheesy and totally delicious! I’ve made this several times now and it’s always awesome. (And I never attempted a double recipe – one batch makes lots!) Thanks again! This recipe was a complete winner! I’ve now made it twice and both times it came out perfectly and honestly, was well received by all. I will admit that the 2nd time I made it I added some browned ground beef, which also was quite good, but the veggie version was great too. Awesome, Mike! So glad to hear it! And I love that you made it your own by adding some ground beef! I don’t have chipotle powder. What can I substitute? You could try smoked paprika or canned chipotles in adobo sauce. If I add ground beef I would need to brown it first right? Can I do that In the instant pot? You can brown it in the Instant Pot! Just set it to saute function to brown first. I have a couple carnivores in the house si u added about 10oz of ground bison. Yum! 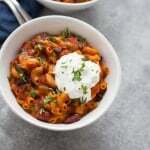 Instant Pots Rock! Keep the great recipes coming, please! Awesome! My husband would love that addition! Thanks for sharing, Jason! I made this for a gathering, used red lentil pasta and successfully doubled the recipe with no change in time ( kept it at 5 min) and it was delicious! A bit spicy but nothing a little cheese and light sour cream couldn’t cure. Everyone was able to eat it no matter their dietary needs. Before I left I cooked some ground turkey and ladled some over it for my husband and he loved it!! I made this tonight and it was delicious!! Thanks for an easy and nutritious Instant Pot recipe!!! Yay! So glad you enjoyed it Valerie! Haha #ChiliGoals. Love it. Thanks, Whitney! 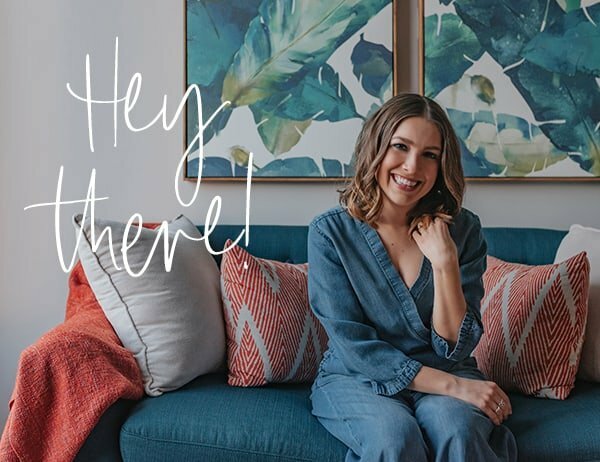 You’re definitely making me want an Instant Pot more and more! If I cave, it’s because of you! Haha I’m willing to take the heat. You won’t regret it! Awesome! This sounds perfect for the instant pot and the kiddo! This sounds so good! I just started using my instant pot and am obsessed! Same!! I feel like I’m on an Instant Pot recipe bender right now ;). Yum! Looks delightful. I can’t wait to get an Instapot. 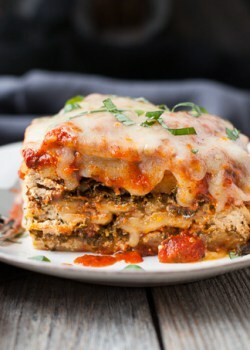 Wow, this looks delish! Will have to try! 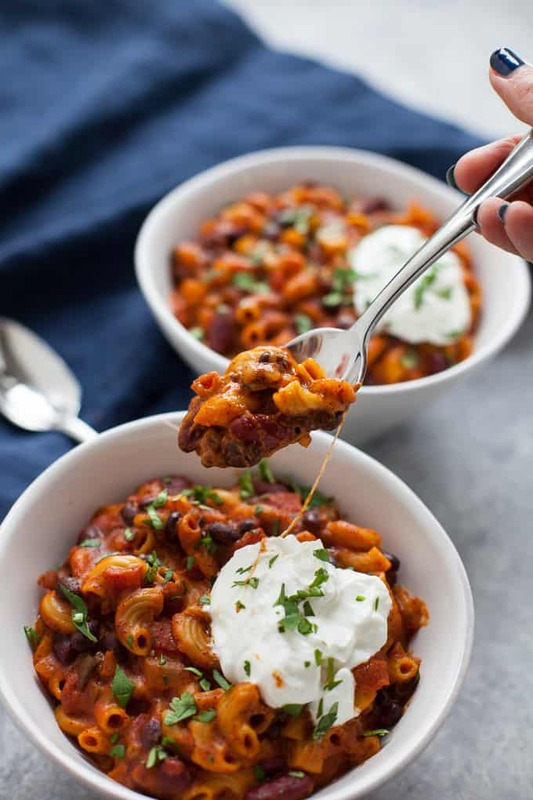 I just got an Instant Pot so I’m always looking for new recipes – and meatless Monday recipes…and chili recipes. Trifecta of deliciousness! That looks delicious, Kara! 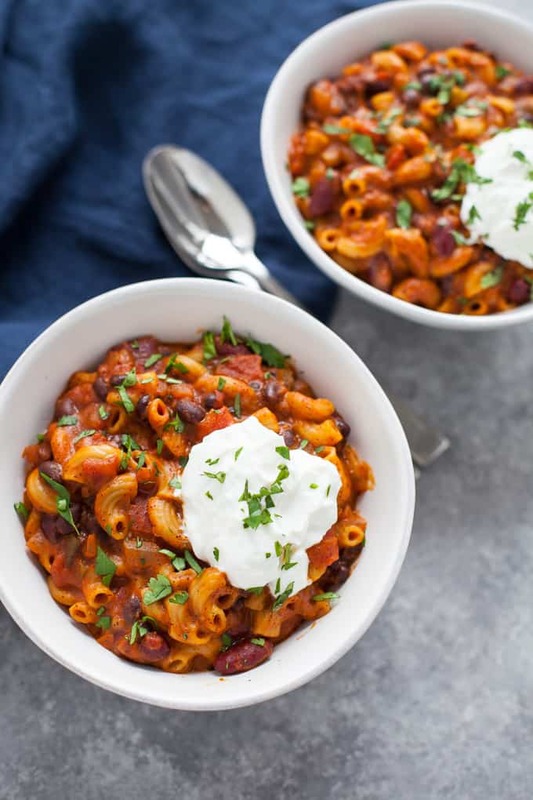 I’m an instant pot superfan, so I love finding new *easy* recipes you can make in the instant pot. Awesome, Alexandra! I hope you love this one too! This looks so good. I mean i add cheese to every bowl of chili, so of course I would love this. Also, i know the instant pot is fast, but I’m amazed this is done in less than 15 minutes! Thanks, Jessica! Chili without cheese is a serious missed opportunity, IMO ;). I really need an Instapot! Where brand do you have? I have the Instant Pot DUO80!